On 31 May 2009, Inter striker Zlatan Ibrahimović's 81st-minute backheel on Serie A's last day won the match and made him the season's top scorer. Playing at home against mid-table Atalanta, Inter had already secured their fourth consecutive Scudetto (including the 2006 title, awarded to Inter after being stripped from Juventus due to a bribery scandal), starting the day 10 points clear of second-place finisher AC Milan. The match began with a flurry of goals. Inter went ahead early with a Sulley Muntary goal in the 6th minute. But Atalanta's Cristiano Doni headed his team level four minutes later. Two minutes after that, Ibrahimović got onto the scoresheet, slipping behind the Atalanta defense to retrieve a lobbed ball and powering it low past keeper Andrea Consigli. The lead did not last long, however, as Luca Cigarini provided another equalizer for Atalanta in the 25th minute. In the second half, Doni scored again--this time from a 25-yard free kick--to send the visitors ahead. Inter then equalized after an 80th-minute scramble in front of the Atalanta goal resulted in a driving shot from Esteban Cambiasso. Only one minute later, Ibrahimović, standing in front of the Atalanta goal, muscled a defender off the ball and slotted it home with a backheel. In addition to securing the 4-3 victory, the goal was his 25th of the season, pushing him past Genoa's Diego Milito and Bologna's Marco Di Vaio--both of whom had 24--for the Capocannoniere as Serie A's top scorer. On 30 May 1957, Real Madrid won their second consecutive European Cup, beating Fiorentina 2-0. Real Madrid were the defending champions while the Viola earned the right to participate in the tournament by winning their first Serie A title the previous season. That season heralded a rise in Fiorentina's fortunes that saw them finish in Italy's top two for the next four years. Their success carried over into the European Cup, where they advanced to the Final with wins over IFK Norrköping, Grasshopper, and Red Star Belgrade, but once there, they ran into the European Cup buzzsaw that was Real Madrid. Madrid had won the inaugural European Cup the season before, and--despite needing a playoff against Rapid Wien to get out of the first round--rolled into the Final with victories over Nice and Manchester United. Playing before a partisan crowd of 124,000 at Madrid's home ground, the Bernabéu, Fiorentina managed to keep the match close. Unlike the previous final, which Madrid won 4-3 over Stade de Reims, the 1957 Final was a defensive battle, with both sides struggling to create scoring chances. Madrid eventually caught a break when the referee awarded a 69th-minute penalty kick that midfielder Alfredo di Stéfano converted with ease. Six minutes later, forward Francisco Gento scored on a breakaway, chipping the ball over Fiorentina keeper Giuliano Sarti. It was Fiorentina's last appearance in the European Cup/Champions League Final, while Madrid went on to win the next three. In all, they have played in fourteen finals, winning eleven, including the most recent one in May 2016. Fiorentina eventually won European glory, however, claiming the 1961 Cup Winners' Cup. Labels: 1957 European Cup Final, A.C.F. Fiorentina, Alfredo di Stéfano, Francisco Gento, Giuliano Sarti, Real Madrid C.F. On 29 May 2006, the Republic of St. Pauli and Gibraltar kicked off the FIFI Wild Cup with a 1-1 draw. Organized by FC St. Pauli, the Wild Cup was an alternative tournament for nations excluded by FIFA, global football's governing body. The organizers openly mocked FIFA by creating a mock federation of their own named FIFI. Six teams participated, including Greenland, the Turkish Republic of Northern Cyprus, Zanzibar, Tibet, and Gibraltar. The sixth team was FC St. Pauli, playing as the Republic of St. Pauli. The entire tournament was organized in under three months, despite token resistance from FIFA, the German football federation (who were hosting the World Cup later that summer), and China, who opposed Tibet's inclusion. Played at St. Pauli's home ground, the Millerntor-Stadion in Hamburg, the opening match kicked off after an announcer declared it a "Sepp Blatter-free zone." After the 1-1 draw, St. Pauli went on to win their three-team group, but lost in the semifinals to Zanzibar, 1-2. Northern Cyprus, the other group winner, went on to beat Zanzibar in the final on penalties, 0-0 (4-1). On 28 May 2003, Juventus and AC Milan needed a penalty shootout to decide the first all-Italian Champions League Final. Played before a crowd of 63,215 at Old Trafford in Manchester, the Final was only the second one in tournament history to pair teams from the same league--Real Madrid defeated Valencia in 2000. The Serie A race had officially ended four days prior with Juventus at the top of the table. Although they finished 11 points clear of third-place Milan, the two teams had split their two league meetings, with each team winning at home, 2-1. The Final was even closer. The only real chance came from Milan striker Andriy Shevchenko, whose early goal was ruled out because his teammate Rui Costa had blocked the view of Juventus keeper Gianluigi Buffon from an offside position. They completed the first 120 minutes of play deadlocked at 0-0. The shootout took place in front of the Juventus section. After four kicks each, Milan were up 1-2, with both Buffon and Milan keeper Dida making critical saves. Juventus forward and captain Alessandro Del Piero converted his team's last kick to level the score, putting the pressure on Milan's last kicker, Shevchenko. But the Ukrainian confidently stroked the ball past Buffon for the win, 0-0 (2-3). Coincidentally, it was the third Champions League trophy for Milan midfielder Clarence Seedorf, who had won it in 1995 with Ajax (against Milan) and in 1998 with Real Madrid (against Juventus). Labels: 2003 Champions League Final, AC Milan, Alessandro Del Piero, Andriy Shevchenko, Clarence Seedorf, Dida, Gianluigi Buffon, Juventus F.C. On 27 May 2000, Rangers defeated Aberdeen in the Scottish Cup Final, making them the first club in the world to secure 100 major trophies. Founded in 1872, Rangers started the 1999-2000 season with 98 major trophies, including 48 league titles, 28 Scottish Cups, 21 Scottish League Cups, and one UEFA Cup Winners' Cup. They had the chance to take four more trophies that season, but were eliminated from the Scottish League Cup and the UEFA Cup in December. The focus on their two remaining competitions paid off--they clinched the league title on 22 April after Celtic's draw with Hibernian left the former 17 points adrift of Rangers with only five matches left to play. Rangers proceeded to finish 21 points clear of their Old Firm rivals in the final table. That left the Scottish Cup Final, played before a crowd of over 50,000 at Hampden Park. Although Aberdeen had knocked Rangers out of the League Cup in the quarterfinals, 0-1 (aet), the Scottish Cup Final was not as close a contest. Rangers won 0-4 with goals from Giovanni van Bronckhorst (36'), Tony Vidmar (47'), Billy Dodds (50'), and Jörg Albertz (51'). Since then, Rangers added to their silverware collection with five more league titles, four more Scottish Cups, and one more League Cup. 26 May 1982 - "Oh It Must Be, And It Is!" On 26 May 1982, Aston Villa won the European Cup over Bayern Munich with an outstanding performance from an unlikely hero. Playing before a crowd of 45,000 at the Feyenoord Stadion in Rotterdam, Villa started the match as decided underdogs to three-time champion Bayern. And their hopes took another hit when their starting goalkeeper, Jimmy Rimmer, had to leave the match after only 10 minutes. He had injured his neck previously and was relying on painkillers to see him through the day, but he could not make it and had to withdraw. Villa sent on his replacement, 23-year old Nigel Spink. Despite joining the club in 1977, Spink had made only one other appearance with the first team. His inexperience did not show, however, and he made several dazzling saves to deny the Germans, who boasted three of the tournament's top four scorers (Dieter Hoeness, Karl-Heinz Rummenigge, and Paul Brietner). Villa scored the day's only goal in the 67th minute. Forward Gary Shaw delivered a cutting pass down the left to midfielder Tony Morley, who dodged a couple of Bayern defenders and slipped the ball behind them and across the goalmouth. Forward Peter Withe was waiting there and tapped the ball into the net for the win. 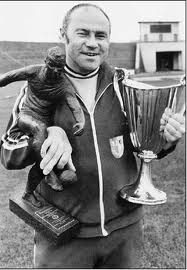 Commentator Brian Moore famously announced the goal by saying "Shaw, Williams, prepared to venture down the left. There's a good ball in for Tony Morley. Oh, it must be and it is! It's Peter Withe!" Spink remained with Villa until 1996, making a total of 460 appearances before moving to West Brom. On 25 May 1901, Club Atlético River Plate was founded in Buenos Aires. With a record 36 titles, they are the most successful team in Primera División history. Named after the nearby Río de la Plata which separates Argentina from Brazil, River Plate won their first Primera División title in 1932 and added eleven more before the 1950s ended. Along the way, the club produced legendary players such as Omar Sivori and Alfredo di Stéfano, both of whom went on to star in Europe for Juventus and Real Madrid, respectively. After a fallow period of almost twenty years, River Plate returned to their winning ways in 1975. But their greatest year was 1986, when they took an historic treble consisting of the league title, the Copa Liberatadores, and the Intercontinental Cup. They maintain a fierce competition with fellow Buenos Aires club Boca Juniors. The derby, known as the Superclásico, is one of the most heated rivalries in sport. At present, Boca have a slight edge, with 132 wins to 114 for River Plate and 113 draws. On 24 May 1915, a group of students in Sofia founded Sport Club Levski. Now known as Levski Sofia, they have won a Bulgarian-record 55 major domestic trophies, including 26 league titles and 25 Bulgarian Cups. Named after 19th Century Bulgarian revolutionary Vasil Levski, the club got off to an inauspicious start, losing their first official match 0-2 to FC 13 Sofia. But they won their first regional title in 1923, then followed that with two more in 1924 and 1925. They won their first league title in 1933 and enjoyed tremendous post-war success, winning five more titles between 1946 and 1953. Since them they have won multiple league titles in every decade, up to their most recent one in 2009. Their tally of 26 league titles is second only to local rivals CSKA Sofia, who have 31. 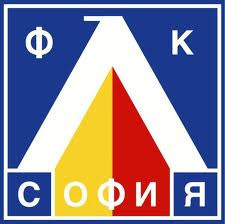 Levski have also starred in European competitions, advancing to the Cup Winners' Cup quarterfinals three times (1970, 1977, 1987) and the UEFA Cup quarterfinals two times (1976, 2006). On 23 May 1937, Bordeaux won their first national title. They have since gone on to become one of France's most successful clubs, with a silverware collection that includes six top flight titles and four French Cups. Founded in 1881 as Gironde Omnisports, the club originally included a variety of sports including gymnastics, shooting, swimming, rowing, and boxing. They added football in 1910, but dropped the sport after a year. They picked it back up for good in 1919. Their first national title came under president Olivier Lhose-Clos, whose tenure began in 1934. In 1937, Bordeaux advanced to the French Amateur Final against FC Scionzier. Played at the Stade de Colombes in Paris as a prelude to an international match between France and Ireland, Bordeaux won 2-1. They followed that trophy with their first Coupe de France title in 1940, then won the league in 1950. They enjoyed their most successful period in the 1980s, winning three league titles (1984, 1985, 1987) and two more French Cups (1986, 1987). 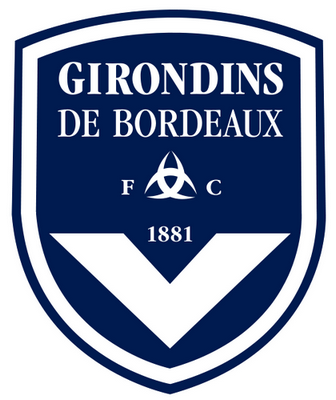 Bordeaux won their most recent trophy in 2013 with their fourth Coupe de France. 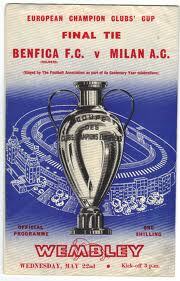 On 22 May 1963, AC Milan stopped Benfica from winning their third straight European Cup, beating the Portuguese side 2-1 at Wembley. It was the first of Milan's 7 European Cup/Champions League titles and the first time an Italian team won the tournament. At the time, Benfica were staking their claim as the best team in the world, coming off back-to-back tournament titles with Final wins over Barcelona (3-2 in 1961) and Real Madrid (5-3 in 1962). They also boasted one of the sport's biggest stars in Eusébio, who late brace provided the winning margin in the previous Final. Mian, however, had stars of their own, including forward José Altafini, who played for Brazil in the 1958 World Cup then for Italy in the 1962 tournament. 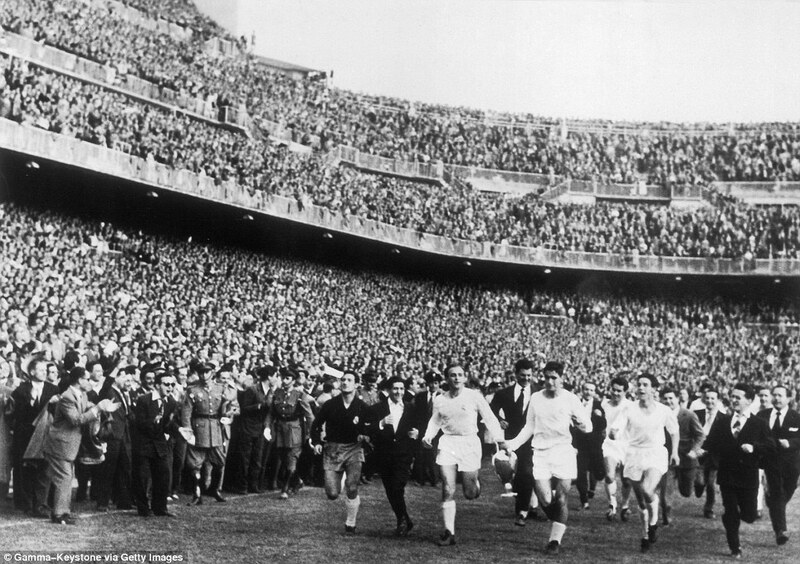 The Rossoneri had been in the Final before, taking Real Madrid to extra time in 1958 before falling 3-2. Playing before a crowd of 45,700, Benfica took the lead with an 18th-minute strike from Eusébio, who sprinted down the middle of the pitch and blasted a right-footed shot past Milan keeper Giorgio Ghezzi. It took Milan 40 minutes to find an equalizer, as Altafini unleashed a right-footed shot of his own from the edge of the box. Just eight minutes later, Altafini found himself in a one-on-one situation with Benfica keeper Costa Pereira. Pereira successfully stopped the initial shot, but Altafini slammed the rebound home to give Milan the 2-1 lead that was the match's final score. Milan went on to win the tournament a total of seven times, second only to Real Madrid's ten. Benfica returned to the Final five more times and were runners-up each time, most recently in 1990 when they lost again to Milan. 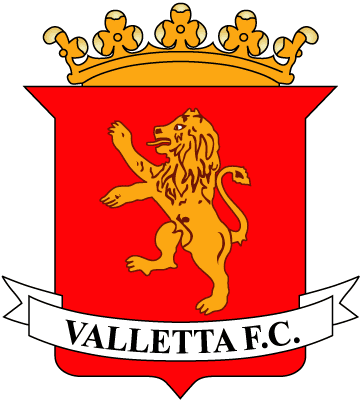 On 21 May 2001, Maltese club Valletta FC completed a incredibly successful season, winning all six of the competitions they entered that year. Based in the Maltese capital, Valletta had already amassed an impressive collection of silverware including 17 previous league titles. In the 1996-97 season, they participated in five different competitions--the Premier League, the Rothmans Trophy, the Super 5 Cup, the Lowenbrau Cup, and the Super Cup--and won all of them. In 2001, Malta added the Centenary Cup to celebrate the 100th anniversary of the Maltese Football Association. Valletta won that trophy in December 2000, beating their rivals, Floriana, after having already won the Lowenbrau Cup in August. The Super 5 Cup followed later that month, then the league title in April, and the Rothmans Trophy on 17 May. Four days later, Valletta won their sixth trophy of the season, beating Sliema Wanderers 2-1 (Sliema had also finished as runners-up in the league, the Lowenbrau Cup, and the Super 5 Cup). Although an impressive accomplishment, Valletta's season was not the best ever. In 1921-22, Northern Irish side Linfield FC won all seven competitions they entered that season. Forty years later, they came close to another sweep, winning seven of eight competitions. On 20 May 1992, Barcelona won their first European Cup, beating Sampdoria with an extra-time free kick from center back Ronald Koeman. In the Final, Barcelona met Sampdoria who were looking to salvage a disappointing season. After winning Serie A in 1991, they had slumped to sixth place in 1992 and would not be returning to European competition the next season. Barcelona, meanwhile, were in the process of claiming their second consecutive league title under manager Johan Cruyff, who himself had won three European Cups as a player with Ajax. Playing before a crowd of 70,827 at Wembley, the match was closer than anyone expected. Scoreless deep into extra time, Koeman's opportunity came in the 111th minute as Sampdoria substitute Giovanni Invernizzi fouled Barcelona winger Eusebio Sacristán just outside the box. Koeman converted the ensuing kick, blasting the ball past the keeper. Although he had contributed 16 league goals that season, the one in the Final was his first in 11 appearances in the tournament. Sampdoria have never returned to the final, while Barcelona were runners-up in 1994 and won the tournament in 2006, 2009, 2011, and 2015. 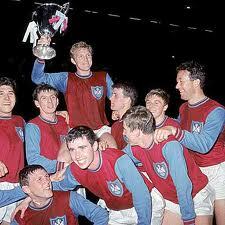 On 19 May 1965, West Ham became the second British team to claim a European trophy, defeating 1860 Munich in the Cup Winners' Cup Final. Played before a crowd of 98,000 at Wembley, the match was widely regarded at the time as one of the greatest European cup finals in history. 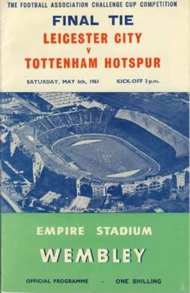 With both teams adopting a fast-paced attacking style, only brilliant play from the two goalkeepers--West Ham's Jim Standen and 1860 Munich's Petar Radenković--kept the two sides scoreless in the first half. Hammers midfielder Ron Boyce sparked the opening goal in the 70th minute when he intercepted a German pass on the edge of the center circle, dribbled up the pitch and played a through ball to midfielder Alan Sealey. Sealey beat Radenković at the near post by slamming the ball over his head into the top of the net. Two minutes later, Sealey scored again as Radenković failed to collect a cross from Bobby Moore, allowing Sealey to knock it over the line. The match ended as a 2-0 win for West Ham, two years after Tottenham won the same competition. They returned to the Final in 1978, but lost to Anderlecht. Labels: Alan Sealey, Jim Standen, Petar Radenković, Ron Boyce, TSV 1860 Munich, West Ham United F.C. On 18 May 1981, former Lyon, Real Madrid, and Monaco star Mahamadou Diarra was born in Bamako, Mali. A defensive midfielder, Diarra started his professional career in 1998 with OFI Crete. After one season there, then three in the Netherlands with Vitesse, he moved to Lyon where he rose to international prominence. With Diarra anchoring the midfield, Lyon won the league in each of his four seasons (the second through fifth of their seven consecutive Ligue 1 titles). Diarra's success at Lyon prompted a €26 million move to Real Madrid in the summer of 2006. In his first season there, he helped Madrid win their first league title in four years, then continued his run of silverware with another championship in his second season--a personal streak of six straight league titles. Internationally, he represented Mali from 2001 to 2014, making 64 appearances and serving as team captain. 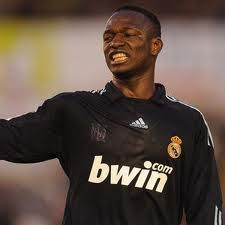 A series of knee injuries and the 2009 arrival of Xavi Alonso pushed Diarra out of his starting role in Madrid and, in January 2011, he moved to Monaco. A move to Fulham followed a year later, where Diarra remained until his retirement in 2014. Labels: Mahamadou Diarra, Olympique Lyonnais, Real Madrid C.F. On 17 May 2000, Galatasaray won their first European trophy, defeating Arsenal on penalties to win the UEFA Cup Final. Despite the presence of several prolific goalscorers--including three-time Süper Lig golden boot winner Hakan Şükür and Arsenal's Thierry Henry--and gifted playmakers like Gheorghe Hagi and Dennis Bergkamp, the first half was a dour affair that saw the referee issue four yellow cards (two to each team). The second half was little better, as both sides squandered chances and the referee issued four more cautions (three to Galatasaray and one to Arsenal). Arsenal gained an advantage in extra time as Hagi received a straight red card for punching Tony Adams. The Gunners pressed forward for the match-winner and almost got it, but Galatasaray's Brazilian keeper Taffarel denied Henry's point-blank header. In penalties, Galatasaray's first three shooters converted, while two of Arsenal's shots were denied by the woodwork. With the Turks leading the shootout 3-1, center back Gheorghe Popescu's kick beat David Seaman for the win. Galatasaray went on to beat Real Madrid in the UEFA Super Cup that summer. Arsenal, meanwhile, returned to a European cup final exactly six years later, losing to Barcelona in the Champions League. On 16 May 1979, Barcelona and Düsseldorf needed extra time to decide the Cup Winners' Cup Final in Basel, Switzerland. Playing before a crowd of 58,000 at the St. Jakob Stadium, the teams exchanged a pair of quick goals from Barcelona midfielder José Vicente Sánchez (5') and Düsseldorf striker Thomas Allofs (8'). Another pair of goals followed before the break, as Barcelona reclaimed the lead (Juan Manuel Asensi 34') and Düsseldorf again equalized (Wolfgang Seel 41'). Then the scoring dried up for a while. After a scoreless second half, they went into extra time, where the goals began to flow once more. Barcelona forward Carles Rexach put his side ahead once more in the 104th minute, then his fellow forward Hans Krankl (pictured)--who had finished second in voting for the 1978 Ballon d'Or--extended the lead seven minutes later. Seel scored once again for Düsseldorf in the 114th minute, but the Germans could not find another equalizer and the match ended as a 4-3 win for Barcelona. It was the first and only appearance in the Final for Düsseldorf. Barcelona, who previously finished as runners-up in 1969, returned to the Final four more times, winning it in 1982, 1989, and 1997. On 15 May 2002, Real Madrid won their ninth European Cup/Champions League trophy, beating Bayer Leverkusen in the Final. The Final--Bayer's first and Real Madrid's twelfth--was a rematch of the two team's quarterfinal meeting in 1998, which the Spaniards won 1-4 on aggregate en route to their seventh tournament title. Like that previous match, Real Madrid were heavily favored and took very little time to stake their claim to the trophy, going up in the 8th minute with a strike from their center forward, Raúl. Bayer did not lie down, however, and quickly responded with a 13th-minute header from Lúcio, their Brazilian center back. Then, in the 45th minute, Madrid got a Brazilian edge of their own when Roberto Carlos surged forward from his left back position and sent a high arcing cross into the box. It dropped to Zinedine Zidane, who executed a stunning left-footed volley from the edge of the box. The ball rocketed over Bayer's keeper, putting Madrid up 1-2. It was the last goal of the match. For Bayer, it was part of an almost-Double, as they also finished as runners-up in the Bundesliga that season. 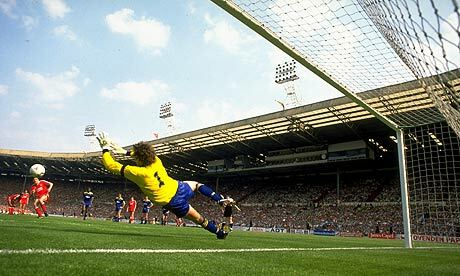 On 14 May 1988, Wimbledon won the FA Cup thanks in part to the first-ever penalty save in the history of the tournament final. It was the last major trophy for the club, who moved to Milton Keynes in 2004 to become the MK Dons. Wimbledon's opponents in the Final were Liverpool, who had won the league by finishing nine points clear of Manchester United. Prior to the Final, they had lost only three times--twice in the league and once in the League Cup--and were heavily favored over Wimbledon, who were seventh in the final table and who had taken only a single point from Liverpool in their two league meetings that season. Playing before a crowd of over 98,000 at Wembley, Wimbledon took a shock first-half lead when midfielder Lawrie Sanchez headed a free kick home in the 37th minute. Liverpool looked certain to equalize in the second half when the referee awarded them a penalty kick in the 60th minute. But Wimbledon keeper and captain Dave Beasant guessed correctly, diving to his left to stop the shot from John Aldridge. It was the first time in the history of the FA Cup that a keeper saved a penalty in the Final. Manager Kenny Dalglish subbed Aldridge out four minutes later for Craig Johnston, but the Reds were unable to crack Wimbledon's defense and the score held, 1-0 to Wimbledon. 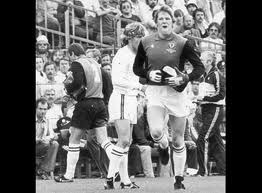 With their reputation as the "Crazy Gang," rumors swirled about wild post-match celebrations, but Beasant later said that he and his teammates were so exhausted after the match that they enjoyed a small party with their families then got to bed early. Labels: 1988 FA Cup Final, Craig Johnston, Dave Beasant, John Aldridge, Kenny Dalglish, Lawrie Sanchez, Liverpool F.C., Wimbledon F.C. 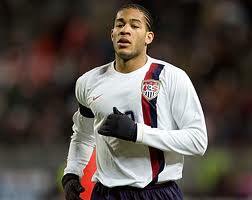 On 13 May 1982, former US international center back Oguchi “Gooch” Onyewu was born in Washington, DC. Onyewu played for years at Clemson University (2000-01), then signed with French side Metz in 2002. He made only three appearances for Metz, however, before moving to Belgian club La Louvière on loan. 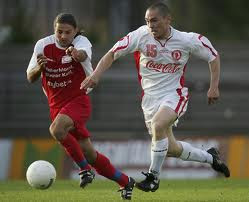 In 2004, he moved again, signing with Standard Liège. He flourished there, twice being named to the Belgian league’s Best XI and winning the Foreign Player of the Year in 2005. He won back-to-back league titles with Standard in 2008 and 2009 before making a shock move to AC Milan for the 2009-10 season. A knee injury forced him to miss the entire Serie A season, however, and in 2011 Milan sent him on loan to defending Eredivisie champions FC Twente, followed by spells in Portugal, Spain, and England. Onyewu made a total of 69 appearances for the United States between 2004 and 2014, winning the 2005 and 2007 CONCACAF Gold Cups. 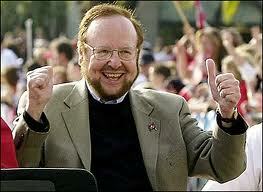 On 12 May 2005, American business Malcolm Glazer acquired a controlling interest in Manchester United. The Glazer family eventually gained complete ownership of the club, sparking a wave of protests that are continuing to this day. Glazer, whose family also owns the NFL's Tampa Bay Buccaneers, first got involved with Manchester United in March 2003, when he and his family purchased a 2.9% share of the club for approximately £9 million. They gradually purchased additional shares, so that by October 2004, they neared the 30% threshold that would require them to launch an official takeover bid. Meanwhile, two other shareholders--JP McManus and John Magnier, who had 28.7% between them--had fallen out with manager Alex Ferguson over issues related to the trio's joint ownership of a racehorse. The two of them had earlier tried unsuccessfully to oust Ferguson and had seen their influence in the club wane as a result. On 12 May 2005, Glazer reached agreement to purchase the shares owned by McManus and Magnier, giving the Glazer family a majority stake of almost 60%. By the end of the summer, they took complete ownership of the club. Despite success on the pitch under the Glazers (with three league titles and one Champions League trophy between 2007 and 2009), the acquisition proved very costly, with the deal's financing costs increasing United's debt to a staggering £716.5 million by January 2010. Angered over the the club's financial state, supporters staged anti-Glazer protests that included the adoption of the club's original green and gold colors and the formation of a splinter club, FC United of Manchester. By 2016, however, the debt level dropped to £322.1 million, while revenue reached a record £133.8 million. Labels: Alex Ferguson, John Magnier, JP McManus, Malcolm Glazer, Manchester United F.C. On 11 May 1983, Aberdeen won the European Cup Winners' Cup, beating Real Madrid 2-1. It was Aberdeen's second time in the tournament; their first, in 1971, ended with elimination by Budepest Honved in the first round. 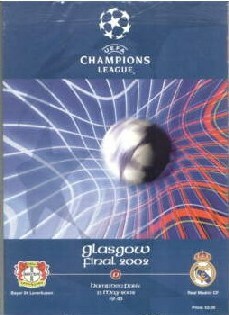 Real Madrid also participated that season, advancing to the Final where they lost to Chelsea in a replay. Playing on a rain-soaked day before a crowd of approximately 18,000 at the Ullevi in Gothenburg, Sweden, Aberdeen fielded an all-Scottish side, including manager Alex Ferguson, then in his fifth season in charge. Definite underdogs, they took a shock lead when forward Eric Black scored in the 7th minute. But the lead was short-lived, as Real Madrid drew level with a 15th-minute penalty kick from forward Juanito. The win made Aberdeen the third Scottish team--after Celtic and Rangers--to win a European trophy. They quickly added to their silverware collection by winning the European Super Cup later that year. Labels: Aberdeen F.C., Alex Ferguson, Eric Black, John Hewitt, Juanito, Real Madrid C.F. On 10 May 1947, a unified British team defeated a Rest-of-Europe XI in a game billed as the "Match of the Century." 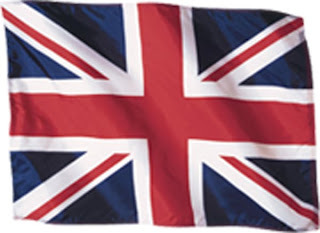 The concept of a British national team dates back to 1908, when a team styled as "Great Britain" won the gold medal at the Summer Olympics. Despite the name, however, the side included only Englishmen. They repeated as champions in 1912, but all four Home Nation associations--England, Scotland, Wales, and Ireland--subsequently withdrew from FIFA over disagreements about the role of professionalism in the sport, bringing the united team to an end. The 1947 match celebrated the return of the Home Nations to the international fold, with the proceeds going to help FIFA recover losses sustained by the interruption of play during World War II. England manager Walter Winterbottom selected the British team, which included five English players, three from Scotland, two from Wales, and one from Northern Ireland. The European team, chosen by Swiss national team manager Karl Rappan, included one player each from France, Switzerland, the Republic of Ireland, Italy, Czechoslovakia, Belgium, and the Netherlands, as well as two each from Sweden and Denmark. Played before a crowd of over 130,000 at Glasgow's Hampden Park, Britain (wearing navy blue shirts and socks with white shorts) rolled to an easy 6-1 victory with goals from Englishmen Wilf Mannion (22', 33') and Tommy Lawton (37', 82'), Scotsman Billy Steel (35'), and a 74th-minute own-goal from the Europeans. Sweden's Gunnar Nordahl scored the only goal for the Rest of Europe in the 24th minute. On 9 May 1937, Sochaux won their first Coupe de France, coming from behind to beat Strasbourg 2-1 in the Final. Founded in 1928 as the Peugeot company team, Sochaux merged with Montbéliard in 1930. The new team quickly established their credentials by winning the league in 1935, one point ahead of Strasbourg. The architect of that title-winning campaign was manager Conrad Ross, then in his first season with the club. After a fourth-place finish in 1936, Sochaux were again challenging for honors in 1937 in both the Coupe de France and the league. The Final was played before a crowd of approximately 40,000 at the Stade Olympique Yves-du-Manoir in Colombes. Strasbourg struck first with a goal from their German forward Oskar Rohr in the 32nd minute, but Sochaux quickly rallied with a 40th minute equalizer from their Argentinian midfielder Miguel Angel Lauri. Then, with only two minutes remaining, Irish forward Bernard Williams delivered the match-winner. Sochaux narrowly missed out on the double, finishing second in the league, even on points with winners Marseille, but with a worse goal differential. They did win the league the following season and won the Coupe de France again in 2007. On 8 May 1974, Magdeburg became the only East German team to win a major European trophy, beating AC Milan in the Cup Winners' Cup Final. Under manager Heinz Krügel (pictured), who joined Magdeburg in 1966, the club had risen from the East German second division to become league champions in 1972. That qualified them for the next season's Cup Winners' Cup, where, playing with a team composed entirely of East Germans, they advanced with wins over NAC Breda, Baník Ostrava, Beroe Stara Zagora, and Sporting Lisbon to face defending champions AC Milan. The Final was played before a modest crowd of 4,000 at Feyenoord Stadion in Rotterdam. The two sides were locked in a defensive struggle for almost the entire first half when, in the 43rd minute, Milan defender Enrico Lanzi put the ball into his own net. Milan sought desperately for an equalizer, but it was Magdeburg who found the next goal with a strike from midfielder Wolfgang Seguin in the 74th minute. That ended the scoring and Magdeburg claimed a 2-0 victory. It was part of a Double for the East Germans, who won their second league title that year. They won the league once more in 1975, then went into decline after Krügel retired in 1976. Magdeburg currently play in Germany's third tier. 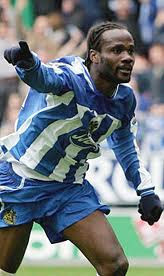 On 7 May 2006, Wigan defender Pascal Chimbonda submitted a transfer request after his team lost 4-2 to Arsenal. And he didn't even have to go into the locker room to get it. It was the last match of the season for both teams and the last match at Arsenal's Highbury Stadium. The Gunners celebrated the occasion with an early strike from winger Robert Pires (8'), but Wigan quickly rallied to take the lead after goals from Paul Scharner (10') and David Thompson (33'). Just as quickly, Thierry Henry equalized for the hosts (35'), then scored twice more in the second half to lift Arsenal to the 4-2 win. After the final whistle, Wigan manager Paul Jewell greeted his players at the touchline to congratulate them on a hard-fought match and a top-half Premiership finish. Chimbonda, however, did not offer his hand, but instead presented Jewell with a transfer request that he had pulled out of his sock. Angered by the show of disrespect, Jewell and Wigan chairman set Chimbonda's transfer fee at the relatively high mark of £6 million and refused to accept a pound less. Indeed, they rejected a £3 million offer from Tottenham and a £4 million one from West Ham. Chimbonda's transfer saga dragged on to the last day of the window when Wigan eventually accepted a bid of £4.5 million from Spurs. He ended up playing for Tottenham from 2006 to 2008, then again for a brief spell in 2009. On 6 May 1961, Tottenham Hotspur completed their Double by winning the FA Cup with a 2-0 victory over Leicester City. Spurs were the first team to win the FA Cup and the League in the same season since Aston Villa did it in 1897. Tottenham had already won the league in a season that saw them hold onto the top spot from the first week to the last. They had endured only seven losses all season, but one of those came at the hands of Leicester City, who won 2-3 at White Hart Lane in the first week of February. Playing before a crowd of 100,000 at Wembley, Leicester suffered an early setback with an injury to right back Len Chalmers (who remained on the pitch in diminished capacity until the 80th minute). They nonetheless maintained their composure and held the dynamic Spurs attack in check for 65 minutes. Then, in the 66th minute, Spurs winger Terry Dyson sent the ball in for forward Bobby Smith, who powered the ball past keeper Gordon Banks. Nine minutes later, the pair connected again, with Smith providing the assist for Dyson's header. Labels: Bobby Smith, Gordon Banks, Leicester City FC, Terry Dyson, Tottenham Hotspur F.C. On 5 May 1992, eighteen people died when a terrace collapsed at the Stade Armand-Césari in Furiani, Corsica during a Coupe de France semifinal. Local side Bastia had advanced through the tournament to face Ligue 1 leaders Marseille in the semifinals, with the winner advancing to play Monaco in the final. Bastia's directors decided to capitalize on the high-profile match by increasing the stadium's capacity, building a temporary terrace to hold an additional 10,000 fans. 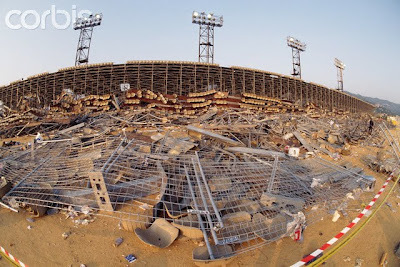 But before the match got underway, the new structure collapsed, killing eighteen people and injuring over 2,300 others. The teams never played their semifinal, as the FFF decided to cancel the remainder of the tournament, leaving the Coupe de France without a winner for the first time. On 4 May 1966, goalkeeper Peter Shilton made the first of his Football League record 1,005 appearances, starting for Leicester in a 3-0 win over Everton. Shilton joined Leicester's youth academy in 1963 at the age of 13, then moved up to the first team in 1966 at the insistence of their starting goalkeeper, Gordon Banks. He was only 16 when he got his first start, replacing Banks for a home match against Everton and keeping a clean sheet in the 3-0 victory. Banks went on to win the World Cup with England the following summer, but Leicester traded him away to Stoke soon after, preferring to stick with Shilton for the 1967-68 season. 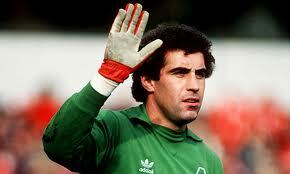 Shilton made 286 league appearances for Leicester before following in Banks's footsteps and moving to Stoke in 1974. After three seasons with Stoke, he moved again, and spent time at Nottingham Forest, Southampton, Derby County, Plymouth Argyle, Wimbledon, Bolton, Coventry, West Ham, and Leyton Orient before retiring in 1997 at the age of 47. He also holds the appearance record for England, with 125 caps between 1970 and 1990.